The credit card industry, like the oil industry, and others that are resource rich because they control extensive and expanding markets, is able to exert undue influence in political processes. It was a major contributor in our George W. Bush’s political campaign, for instance. Indeed, “the largest single corporate donor to George Bush’s 2000 election campaign was a credit card company, MBNA” (since that time, acquired by Bank of America). We now have the most anti-consumer bankruptcy laws on the books that have been seen since the days of debtors’ prisons. The credit card industry pushed for that legislation for years, and finally the path was cleared, by elected officials, such that the industry’s major players could exact “unconscionable” penalties upon consumers. Thus, the prison is now simply, an economic one. According to a United States Government Accountability Office (GOA) report entitled, CREDIT CARDS: Increased Complexity in Rates and Fees Heightens Need for More Effective Disclosures to Consumers, “35 percent of their [credit card issuers’] active U.S. accounts were assessed late fees and 13 percent were assessed over-limit fees in 2005.” Even the IRS uses a postmark to signify compliance with the spirit of a taxpayer’s filing deadline. Credit card companies will impose a late fee even if someone is “one hour late,” and they are racking up huge profit margins on these fees. The industry is also able to suppress negative portrayals in the media, to a large extent. Every time I turn on the television, I hear the upbeat music and see the imagery in the commercials supporting the industry’s various brands. Chase Bank has a “Freedom Card,” which is heavily advertised. Even though the credit card industry’s abusiveness and usurious practices impact a substantial number of all Americans, and it has earned the distinction of being the most complained about industry of all (as per PBS, quoting the Better Business Bureau), we see very little negative news coverage in the media. Certainly there is some, but the latest celebrity buzz is more likely to get hours and hours of airtime, and pages and pages of ink. What we do see is a constant barrage of “feel good,” live life to the fullest messages. According to TNS Media Intelligence, by industry, financial services ranks third, behind non-domestic (first-ranked) and domestic automobiles (second) in media ad spending. In other words, the financial services industry, of which credit card companies are a substantial part, ranks second in media ad spending behind the automobile industry (when the spending in the two automotive categories, non-domestic and domestic, is combined). Let’s put two and two together now, shall we? Do you think media industry advertising sales executives want their news teams irritating the credit card companies’ executives? Even where the industry has directed substantial investments in promotion that do not involve the media directly, it has indicated that there is a “pot of gold” to be had in earning its dollars as an advertising medium. 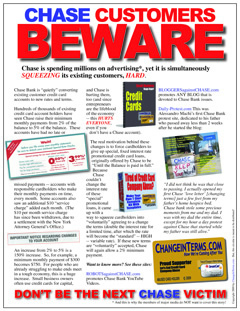 According to a Pitney Bowes research paper, “Credit card firms are the principal sender of bills and solicitations mail to households and businesses,” and “the past several decades have seen substantial advertising mail growth from credit card institutions.” Broadcasters, print, and transit media would like the industry to switch, of course, and it is unlikely that they would come courting with a proposition to do so while also carrying a stack of negative business news reports in their briefcases. So where does that leave us, decent citizens who try to pay our bills, raise our families, and earn a little piece of the “American dream”?